Home » tech news » Star Wars fan alert: Go to Google, type this phrase and ta-da! Google is gearing up for 'Star Wars: The Force Awakens' release by adding its own Star Wars theme on its products. Users on Google can choose between the dark side and the light side of the product from here, and once done they can choose between various themes by clicking on the icon for it. However, there is one particular which the users must try out as a pat of this Star Wars theme. 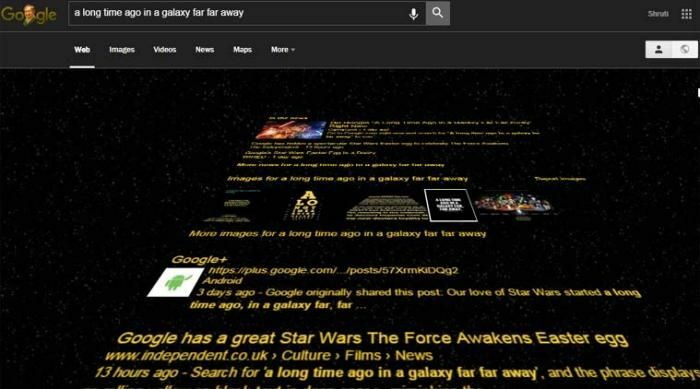 Go to Google, type this phrase 'A long, long time ago, in a galaxy far, far away,' and you will be welcomed by search results in a way they are displayed in Star Wars movies; the yellow text scrolling upwards with black space in the background. However, in order to get these results, one must activate Star Wars theme by picking either the good side or the bad side and enable it on Google search as well. Otherwise, typing this phrase will not work.